Apparently, I'm still dealing with my obsession with "Magnificent Obsession," the highly unlikely August Vogue story where Natalia can't stand Ewan McGregor, for reasons which remain unclear, and runs off (or, just to de-class the joint a bit "r-u-n-n o-f-t" as they say in O Brother, Where Art Thou). Anyway, it's the shoes. 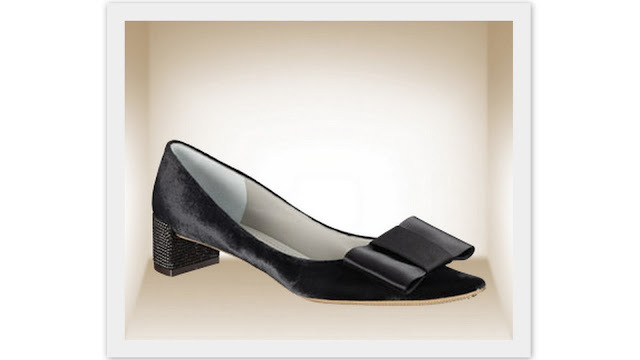 There's a pair of divine black flats with bows so large they almost conceal the fact that they're on a foot. The shoes are Louis Vuitton's Beauty Pump in black velvet, with a Swarovski crystal covered heel. I won't tell you how much they cost, just in case you have a heart condition. More LV bounty; other versions of the Beauty Pump, and open-toe bow options from the Monica line. Charming, no? Oh no! Why did I have to read this! I am now obsessed with those bow shoes...they are perfect!!! Loving this post more than you know!! Love that retro loveliness. And, despite the designer price, it is very DIY-able. Maybe I need to give it a try. Love them with the super-pointy toe and chunky heel. What a wonderful contrast. I have a pair of pointed ballet flats with a bow and just really like them. oh yes. i am currently loving this look...so feminine,no? O.K. I'm once again showing my age but shoes like these use to be the rage in the late 60's. I have vivid memories of having a navy blue & white pair & one in the classic black. It's just one of those styles (like the LB shift dress) that seem to never truly fade away. As for that photo shoot, it 'is' an obsession. The marketing folks should be getting a raise with that one. I'd be tackling Mc Gregor to the ground trying not to scuff those shoes! It's funny because just the other day I was wondering about where my most recent obsession with bows came from. I want bows on my shoes, belts, dresses and in my hair (not all at one time, mind you. I do have some regard for not looking like a 5 year old). Regardless, there's just something about a bow that bring a smile to my face. Oh My remember the 60s I had some shoes with big bows, didn't everyone?